GOT QUESTIONS REGARDING OUR PRODUCTS? CONTACT US! The Pipe Joint System is becoming more and more popular among producers introducing Lean Manufacturing. The flexibility of the production greatly depends on the quick adaptability of the factory layout to the current needs. The modular construction and great variety of the system components gives it an advantage over traditional (welded) solutions. It takes as little as few hours from the design to set up the construction, and a few minutes to modify it. An invaluable characteristic of the system is its universal application. The appropriately designed joints allow to build both static and dynamic constructions, therefore making it better than the alternative system using aluminium profiles. PJ System is a modular system consisting of pipes (ABS coating, ESD and nickel plated), joints, roller tracks, casters and other finishing accessories. The system enables quick, easy and clean production without additional skills or assembly tools . The variety of the components facilitates the making of any spatial construction. The individualization of tools is playing an increasingly important role at manufacturing plants. It refers to both the production as well as logistics. The flexibility of the production process influences work efficiency and costs connected with the introduction of changes. These changes are the driving force of development. That is why both the place and the tools should be adjusted to the changing conditions of the consumer market. 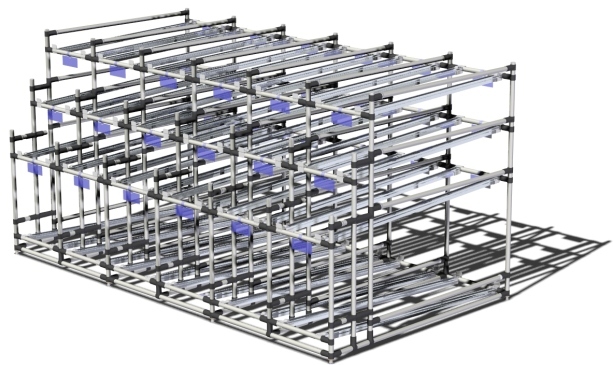 The PJ System is perfect to model flexible solutions. Due to modular construction, wide variety of components and Lean Teams involvement the changes are natural and easy.